The WW&F Railway Museum held its annual Spring Track meet April 28, 29 and 30. More than 50 members and friends participated in the weekend, and by the end of the third day of work Sunday, the track crew had ballasted and surfaced over 900 feet of track. The net result of their three-day effort was the removal of two slow orders on the main track and the release of over 600 feet of track north of Alna Center for regular service. The WW&F's serviceable main track is now slightly more than 2.1 miles. On Friday, the crew concentrated first on a slow order just south of Alna Center, in the approach to the south runaround track switch. They unloaded stone by the time-honored WW&F method of shoveling it from flatcar no. 126, making its maiden "revenue" trip. Then they jacked the track to the proper level and used pneumatic hand-held tampers, affectionately known as "jitterbugs," to tamp the new ballast into place. Once that work was completed, they moved south to an area north of the Humason Brook trestle to continue their efforts to fill in a sag in the grade. This work was begun last fall, during the deluge that lasted all weekend. In the end, the crew ended up jacking a portion of the track and raking out ballast they had installed last fall. The end result, however, was worth the grief and aggravation that work entailed. On Saturday, the entire crew moved north of Alna Center and began unloading ballast and tamping track. Both flatcars were used for this project, with steam locomotive no. 10 hustling one or the other empty car to Sheepscot for loading while diesel no. 52 moved the loaded car into position for unloading. By the end of the day Saturday, the work had progressed north to within 150 feet of the culvert at the bottom of the grade, and on Sunday, the crew worked until they ran out of ballast. A large crew participated in the WW&F's Spring Track Meet weekend. 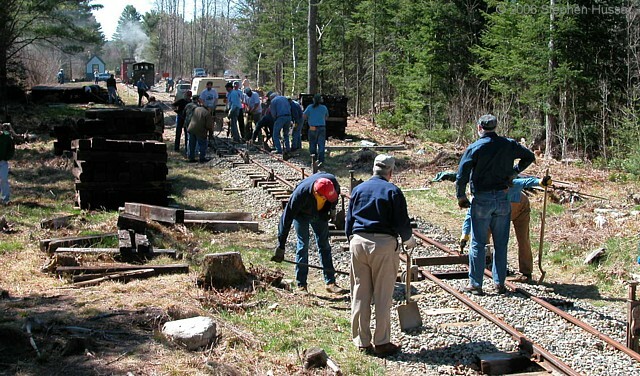 North of Alna Center, they concentrated on ballasting and tamping track. Closest to the camera, a crew uses track jacks to level the track, while in the middle distance, another contingent tamps with pneumatic tampers. In the distance, at Alna Center, engine no. 10 swaps cars with diesel no. 52. Photos by Steve Hussar. Stretching before the track gang is about 1,200 feet of grade ready for rail, and beyond that is another 1,900 feet of grade cleared of trees but still in need of final grading. Everyone is looking forward to next fall's track weekend, when the next phase of construction toward "Top of the Mountain" will begin. 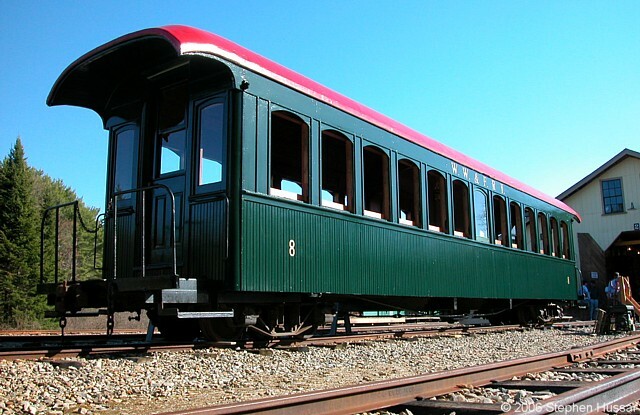 Meanwhile, at Sheepscot, another group of volunteers had painted coach no. 8, received from Edaville last fall, from Edaville's yellow and green paint scheme to the WW&F's standard "evergreen." A number of windows had been removed from the car for rebuilding over the winter, and other windows were removed for restoration as well. By the end of the weekend, gold lettering proclaiming "W.W. & F. RY." and the number 8 had been applied. Coach no. 8, resplendent in its new green paint, shows off its gold lettering as well. The car's windows were removed for repairs and painting. The arch bar trucks under the car will be replaced by a pair of Jackson & Sharpe trucks after rebuild. Other volunteers worked on a replica handcar under construction, assembling materials for hand brakes for coach no. 8 and flatcar no. 126, and trenching for a water line to the new water tank. And we can't forget the folks who worked in the kitchen, preparing lunch and supper each day for the workers.